Danisco Animal Nutrition participates in major industry conferences and events around the globe. See what's coming up or view our past events and webinars. 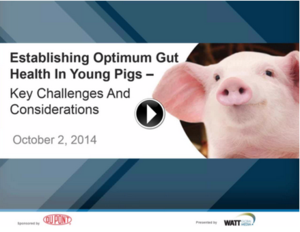 In this replay of a webinar hosted by WATTAgNet, John Pluske of Murdoch University, Australia and our Global Development and Technical Director, Gary Partridge discuss key challenges and considerations in establishing optimum gut health in young pigs.